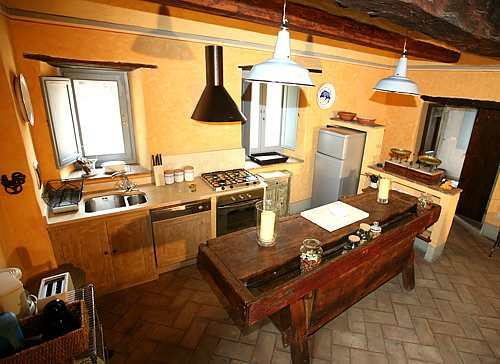 This Tuscan family estate has been completely restored as a deluxe holiday rental for up to 16 persons. An ideal villa for a large group of family or friends. Villa MONTE ROSA is load with amenities, charm and antiques - precise detail to your comfort and offering you the full Tuscan experience. Close to restaurants, shopping, Italian cafes - you will find everything you need only minutes away. 7 double rooms (5 with double beds and 2 with twin beds, which can be tranformed in a double bed on request); 5 bathrooms plus 1 service bathroom with WC and sink. Great position for day trips to major sites: Siena, Florence, Montepulciano, Arezzo and much more. 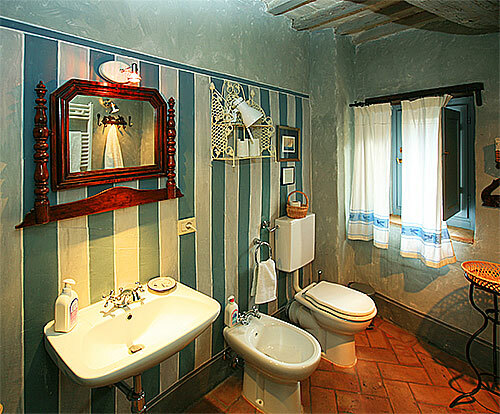 Fabulously restored Tuscan vacation rental with panoramic pool set on a historic family farm. This seven bedroom villa has a beautiful green garden planted with blooming plants, cypress trees and the aromas of Tuscany such as lavender and rosemary. 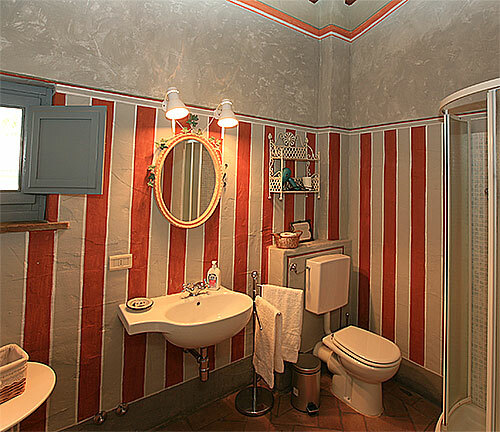 Tastefully decorated in the characteristic Tuscan style – you will find yourself enjoying a slice of the “real Tuscany” starting with the wonderful outdoor environment, the interior details, the helpful owners and many extra special services. The large kitchen is furnished with a classic stone fireplace and a massive wooden table reminiscent of yesteryear when the whole family would sit down for meals together. Furnished with special attention to details, you will find only the best modern equipment starting with a large refrigerator with freezer, stove with oven and a dishwasher. There are three bedrooms on the ground floor – each with its own particular personality starting with the furnishing to the special linens. There are three bedrooms on teh first floor. The 3 larger bedrooms all with a beautiful doublebed have each a private en suite bathroom with tub or shower, WC, bidet and sink. The bedrooms have Air Condition. Consumption is paid extra directly on site! Each bedroom is cozy and furnished with antique pieces including beautiful dressers and night stands. The owner paid special attention to restoring the floors and wood beam ceilings to accent their charm. On the first floor there is a large living room with a cozy wood burning stove. There is a second full kitchen and a lovely table for smaller groups to enjoy breakfast of snacks together. This floor has a great sitting area where the whole group can hang out together before or after meals. There is also a loft giving you an extra space for spreading out. All windows have screens – so you can sleep with the windows open listening to the birds and the gentle breeze which keeps this area fresh and comfortable even on those sunny Tuscan days. 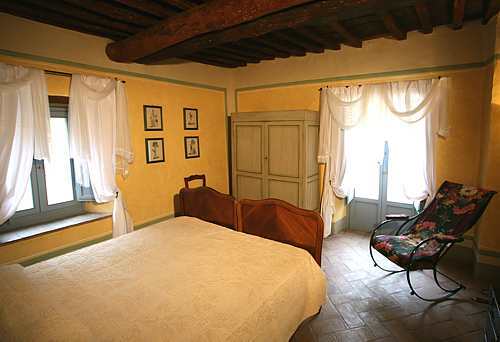 The area is just a short distance from shops, restaurants and public transport to Arezzo, less than 3 km away. Outside of the in-law suite is a relaxing covered terrace with a table suitable for the whole group to enjoy meals outside. On the ground floor, the owner has also set up an in-law suite, complete with sitting room area and full size sofa bed for two adults. There is a fully equipped kitchen for preparing meals. On the first floor the bedroom has a stupendous view of the valley and pool area below. There is a bathroom on the first floor with a shower, bidet, WC and sink. The owner herself opens the doors of this interesting piece of history for a welcome aperitivo during your stay, where she will offer you a taste of Tuscany and their family production of wine. In addition to being very knowledgeable about the area you will find that the owner can assist you in daily maid service, a chef for in house meals and babysitting service. The owner lives in a majestic villa nearby – built in the 1500’s this villa is a stately example of the nobles who once ruled in this area. There is an authentic cantina which the owner will open for your inspection, and upon request can arrange wine tastings in this one of a kind atmosphere. We loved our stay at this villa. The hosts were so warm and welcoming and kept popping by regularly to make sure all was well. We couldn't fault anything. The house was beautiful, immaculately clean and huge. There were 3 kitchens, 6 toilets, multiple dining areas and a fantastic pool, ample room enough for our group of 9. Every detail was considered from hair dryers, dishwasher tablets and even bicycles to borrow. The area is beautiful, stunning views from the house and from the pool. There are lots of lovely historic villages to visit in the vicinity and our hosts recommended restaurants and shops to visit locally. The only gripe was that we didn't stay longer! Christiana and Niccolo, thank you for making our holiday so enjoyable. Thank you also for arranging Matts birthday dinner party. The food was delicious and so plentiful that we didn't have to cook the next day. Cristiana the Linguine Vongole was fantastic! I didn't mention it on the review as otherwise everyone would want that and it would be so much work for you! You were so generous with your time and effort to make our stay just perfect, we really appreciate it. Thank you too for showing us around your amazing house. The children all had a great time and are still talking about you, the holiday and the dog! Out of this world! Simply superb! Villa Monte Rosa was home for my extended family for a glorious week in Tuscany. Everything about it was just perfect. Nicollo was highly responsive and helped with everything pre-visit. On arrival, his Mum took over. Cristiana was the perfect host- elegant, charming and generous. It was a real privilege to get a glimpse into their family history by staying at the Villa. Everything was superbly presented and the location was the best. There was enough to visit near by for those who didn’t want to laze by the pool. Our family group of 14 will remember the trip for a long, long time. Our stay at the Villa Monte Rosa was beyond amazing. The photos are beautiful, but after we arrived we were in awe of the beauty of our renovated farm house and the grounds we were able to use. It's a truly remarkable place. Niccolo went out of his way to accommodate our needs. Christiana (his mother) was extremely generous and kind. We were able to communicate without any problems, both speak English well enough to get by. We did a cooking class and a wine tasting at the villa on the property and loved both. Italians are so kind and passionate about what they love. The town of Arezzo was not far away and a grocery story with anything you need. We wish we would have planned a longer stay--next time we will make more time to explore the castles and sites in Arezzo. Thank you Niccolo and Christiana for a beautiful stay. We rented the villa for a birthday celebration with 12 of our family and friends and had a truly wonderful week here. The villa is every bit as beautiful as the pictures. 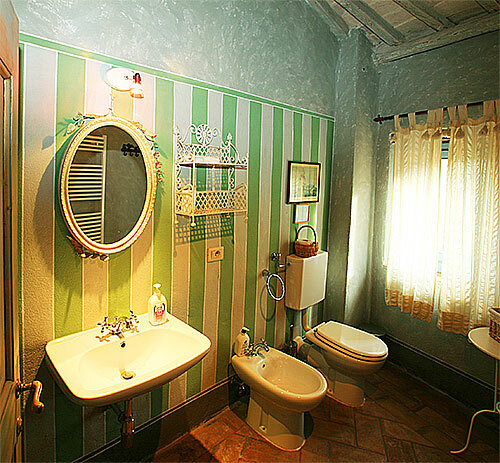 Every room was full of character and tastefully decorated. The pool was a perfect place to relax and cool off on hot days. The main kitchen is well equipped and spacious and we had a great time cooking together. We also BBQ'd on a few nights and had some very nice candlelit dinners on the terrace. Niccolo was incredibly responsive and helpful from the moment I enquired about the villa. His directions to the villa were spot on, he recommended several restaurants in Arezzo (even making a reservation for us on one night), he arranged a horseback riding excursion and finally, he arranged for a catered birthday dinner and cake to be cooked at the villa for us (both of which were top notch). We felt that he really went out of his way to make our stay pleasant. We found that apart from Arezzo, the other major cities are an hour or more away, making day trips time-consuming. This villa is wonderful for people who want to relax, unwind and stay local. 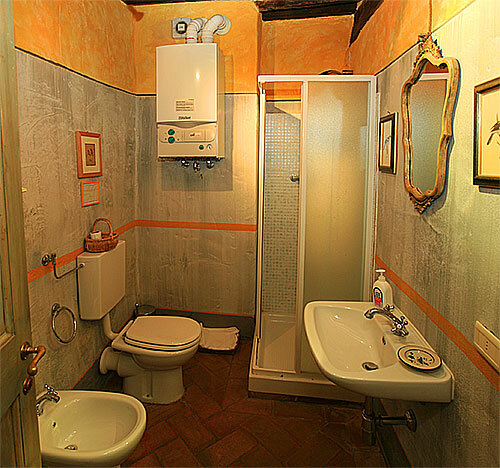 Personally, we felt that Arezzo embodies all that is charming about Tuscany. It was full of character, but not too touristy and crowded. We enjoyed our time there very much. Fortunately, we happened to be staying at the villa just a week before a medieval tournament was to be held in Arezzo. We were able to see the practice sessions in the evenings, which were interesting and fun. All in all, we highly recommend this villa and hope to return sometime in the future! Thanks Niccolo! This residence is a real gem. We holidayed as three families, all with two children between 5 and 8. The Villa has ample space, enough to give each family both their privacy, and to be able to come together for long lunches and dinners surrounded by beautiful vistas of the tuscan countryside. The pool was a great hit with all, and a welcome break from the amazing weather. Everything is superb, but I think the lasting impression we'll take with us is the vast space and variety in and around the villa. It was too easy to spend nearly all of our time their relaxing. Our hosts Niccolo and Cristiana, were ever helpful, attentive and very thoughtful, but not at all intrusive - Just nearby if we needed them. We were made very welcome from arrival right through to our reluctant departure. I will be recommending this find with friends and family. We stayed with a group of 10 people in the villa for a week and we had an amazing time there. The villa was awesome, it was even better than we already expected from the reviews on this site. We had a lot of fun days and nights sitting all together at the pool or at the pergola and it was really cozy. The description of the villa showed on this site and on the pictures is really matching with the experience in real life. There is an amazing view at the pool off the valley, the pool is really big and the area around the pool is comfortable. The rooms are large and everything was really clean, also there was also a lot of equipment in the kitchens and this was really nice. There was more than enough space for 10 people and there were a lot of places were we could sit all together. The benefit of this villa is that we had so much privacy, it was really comfortable to stay in the villa. We received a very warm welcome and the hosts are really lovely people. We also had the diner at the villa of the mother and this was a really nice evening for us with very delicious food! If you go to Villa Monte Rosa, I would suggest to do the diner with your group! We look back to a fantastic holiday with our group of friends! I can only really echo what the other reviews say about what a fantastic place Villa Monte Rosa is; it really is the best experience I've had. 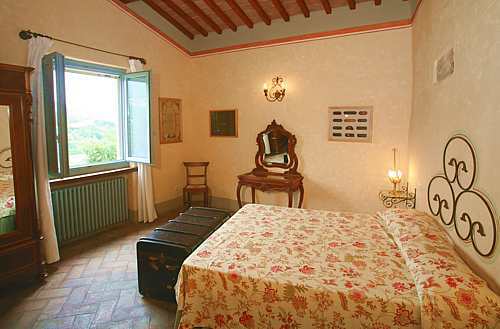 The setting of the villa is spectacular, surrounded by the rolling Tuscan hills. The house itself has been beautifully restored and is absolutely enormous and also very comfortable (having dinner in the farm house-style kitchen in front of the open fire was magical!). It's also a great base from which to explore Tuscany with Siena, Perugia, Montepulciano and Florence all easy drives. The nearest town, Arezzo, is also really charming and worth spending some time in (there's a huge antique fair the first weekend of each month). Finally, as with the other reviews, I have to say a few words about Niccolo and Cristiana who were such wonderful hosts and really looked after us, keeping us well fed with home made pizza, tarts and their own Vin Santo. Villa Montinana is a truly special place and I really can't recommend it more highly. We can't wait to visit again! Villa Monte Rosa is a wonderful place! The villa and it’s environment is even more beautiful than in the pictures. It is also very well located. It was easy to travel to the villa from Rome. There is a lovely old town Arezzo quite near and it was also easy to go to Siena and Firenze by car. We mostly choose a country road to see the views, which were like in a post card, but the highway worked well too. We spent time in villa Monte Rosa mostly at the big private pool area with a lovely view and also did some barbequeing in the evening. The area is also suitable for bicycle trips (with hills up and down) and there is a small gym, which is nice if you want to train during a hot day. The villa is huge – there would be space for example for three families, as each floor has a kitchen and also two bathrooms. Each floor has its own entrance and that makes it even easier to have a long nice spleep at night, even with a bigger group. The beds were comfortable and you could have the room nice cool and dark. The villa was clean and well equipped. It was easy to cook for a big group in the kitchen. Niccolo replied quickly to our questions and we felt very welcome at the villa! We also visited the main villa, which was a really special experiment for us. Niccolo’s mother Cristiana is a sweet person and made us also feel very cosy and wellcome at the village. If you are interested in football, you may go to see a Serie A match eg. in Firenze or Empoli. We happened to see a local game late in the evening in Rassina. The week was everything and even more than we expected and we warmly recommend this place! We want to go to Villa Monte Rosa and Toscana again. Thank you so much Cristiana and Niccolo! We absolutely love Villa Monte Rosa! Both Niccolò and his mother Christiana (the owners) were there to meet me the afternoon before my guests arrived. They were very warm and gracious, and made me feel immediately at home. The property is far more beautiful than these photographs illustrate. Every last detail in the house we rented was perfect... the beds and bed linens were exceptionally beautiful and comfortable. The bathrooms were well appointed and modern. All throughout the house, the furnishings, tableware and ornaments are all top notch... a truly beautiful and comfortable interior with three living areas and three fully functioning kitchens available, not including many comfortable seating places outside the house. The pool was immaculate, and had an amazing view of the valley and the hills rising from the banks of the Arno. The wifi functioned very well, and it was very nice to have access to air conditioning on the few hot nights we spent there. I also appreciated that we had access to a clothes washing machine and two dishwashers! Really perfect for a large group of people. We paid to have Christiana organize a private dinner cooked by her chef... it was a high point of our trip. Many thanks for an incredible evening. All in all, this place was by far the best house I have ever rented for a holiday outing... the location just 20 minutes from Arezzo was far enough to feel remote, but still within easy access to shopping, groceries and restaurants. We made use of the Arezzo train for many excursions to visit the hill towns of Tuscany. I will be back as soon as I can gather together another group of friends to experience this wonderful property and these gracious hosts. Me and a group of 13 friends had an amazing week at Villa Monte Rosa. The villa has so much space and different areas to relax that we were always comfortable. The surrounding area is beautiful and the views from the pool are breathtaking. There is so much to like about this holiday home: the pool, games room, pizza oven, the quality of the furniture, traditional decor and outdoor eating areas. With the right group of people, it's impossible not to have an amazing holiday at Villa Monte Rosa.